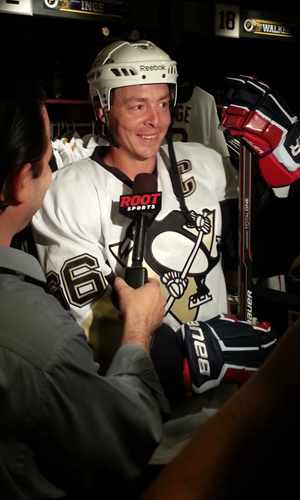 Lord Stanley's day at PNC. 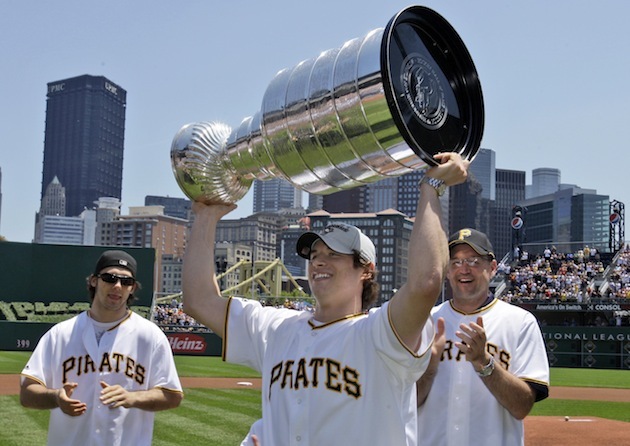 In May of this year, the Pittsburgh Penguins were heading into the Stanley Cup Playoffs with some unexpected supporters from another major professional sports team, the Pittsburgh Pirates. During an early-season road trip for the city's Major League Baseball team, players proudly sported Pens jerseys in a show of unity, with then-Pirate Brandon Inge going so far as to don full gear and a Mario Lemieux jersey in the Windy City before a game with the Cubs. Come to think of it, maybe this angered the hockey gods, thus explaining the so-called Southie Sweep. The thing is, for the Pirates, now is the time. As of this writing, the Pirates hold the National League Central lead by 2 games over the St. Louis Cardinals, after dropping 2 out of 3 to that team and the Cincinnati Reds only a half game behind that. With only 44 games left in their season, this IS the playoffs for the Pirates. This is a team who has unexpectedly revitalized an entire city of sports fans. This is a team who, in one season, has taken 20 years of bad juju and simply shrugged it off, at various times either holding or sharing the best record in baseball. It's a team that has finally made PNC Park the place to be during the summer months. More importantly this is a team that has transformed its entire fan base's mindset of believing that .500 could be within reach to believing that the NL Central was theirs for the taking. The Pirates of 2013 have everything a Pittsburgh sports fan asks for: young, exciting talent with a respect for the game itself, an uncanny mix of speed and athleticism, players that want to be here. Most importantly, the players seem to genuinely appreciate the city and its people, a trait that had been missing for much of the last two decades. But, try as they might, the fear of the "inevitable collapse" still looms heavily in the minds of many a Pirates fan. It's a conditioned response, particularly after the huge disappointments of 2011 and 2012. And it is why the remaining 20 home games on the Pirates schedule is the perfect time for the Penguins to "reciprocate" that support. 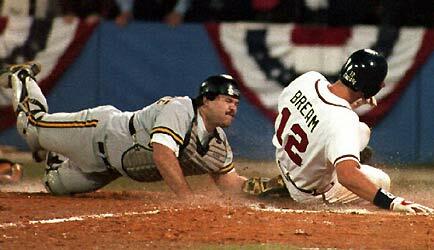 The Pens had their lean years, which coincidentally started around the same time the Pirates slide began. More recently, however, they've had a great number of successes. Now is the time to use those successes to help the oldest Pittsburgh team back into the postseason for the first time since 1992. Now is the time to help these Buccos to usher in the era of "The City of Champions," as opposed to "The City of Champions (And the Pirates)." Now is the time for the Pens to help Raise the Jolly Roger.